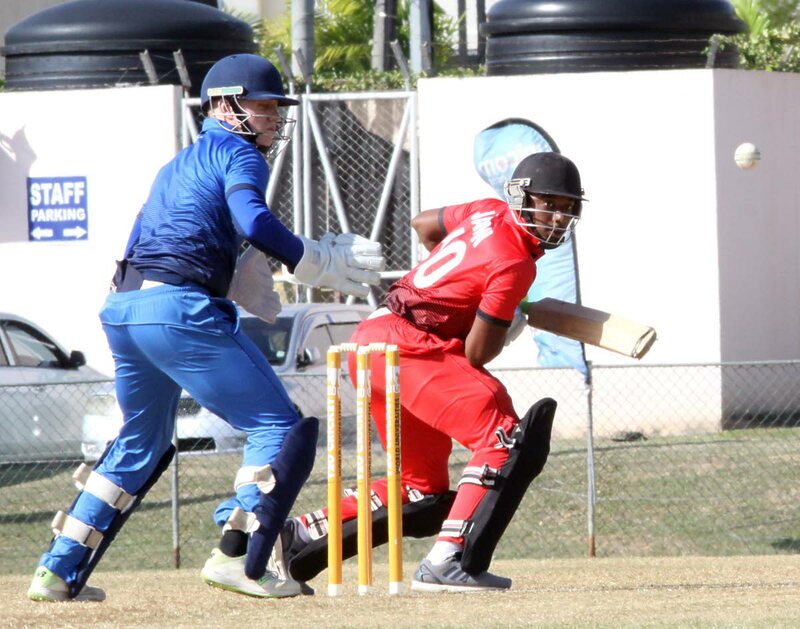 THE Tertiary Sports Association of TT (TSATT) won its first match in the inaugural UWI World Universities T20 Cricket Tournament by nine runs yesterday afternoon, at the Sir Frank Worrell Ground, St Augustine. TSATT won the toss and decided to bat, making 132 for five in their allotted 20 overs, before restricting Oxford Marylebone Cricket Club University to 123 for nine. TSATT started badly as opener Mikel Frederick was stumped for duck off Liam Burgess, before Mohammed Rizvi ran out Justyn Gangoo for one. Skipper Mark Deyal (12) was then stumped by wicketkeeper James Seward off Burgess to leave TSATT at 27 for three in the fifth over. However, Randy Mahase (22 off 22 balls) and Saiba Batoosingh (61 from 43 deliveries) took the score to 60, only for Rizvi to scalp Mahase with a careless lob to Christopher McBride. He cracked four fours in his knock as Batoosingh was left to bear the brunt of the workload. The all-rounder tried to speed up the scoring rate with a couple fours and three sixes as he ended his innings in unbeaten fashion. Jason Batson chipped in with 14 but TSATT just couldn't muster late boundaries to propel them to a higher total. Burgess ended with two for 22 from his four, while Rizvi also staked a pair at the expense of 25 runs from his quota, leaving Oxford with a fairly modest total to chase. Oxford got off to a flying start with McBride and Harry Adair rushing the score to 26 from the opening two overs. Their partnership produced 33 in the third over when Gangoo had McBride stumped by Mahase for 18. He lasted 11 balls with four fours to his name. Adair tried to take his team home, making 45 from 21, with two fours and four sixes, but support was hard to come by. By the time he was run out and William Rogers was bowled by Mark Deyal for one, it became the Reinzo Trotman show. Trotman removed Matthew Taylor LBW for two and added Seward (8), Thomas Heathfield (12) and Rizvi (13) to his list of victims, as Oxford found themselves stymied. He also claimed Burgess, who cut straight into Batoosingh's hands at square for a duck, setting up Deyal to have Dominic Clutterbuck stumped for nine to compound the opposition's downfall. With 21 needed off the final two, Oxford failed to garner any momentum with Will Heathfield left stranded on 12 and David Murphy on duck. The Englishmen closed up shop nine runs short, with Trotman claiming man-of-the-match plaudits for his five wickets for 13 from his full quota. Deyal chipped in with two for 29 as his team rebounded from an opening-day loss to UWI last Thursday. TSATT will face tournament favourites Combined Campuses and Colleges today at 6.30 pm at the same venue, and Oxford resume action on January 15 against UWI at 2 pm. Summarised scores: TSATT 132/5 (Saiba Batoosingh 61 not out, Randy Mahase 22, Liam Burgess 2/22, Mohammed Rizvi 2/25) vs OXFORD 123/9 (Harry Adair 45, Christopher McBride 18, Reinzo Trotman 5/13, Mark Deyal 2/29). TSATT won by nine runs. Reply to "TSATT keep visiting Oxford winless"